This film will be airing on the Encore Suspense Channel in the near future. It is scheduled for December 3, 8, 23, 27, and 31st. More dates added: January 1 & 27; March 2, 7 & 10. Incidentally, the 1978 remake with Donald Sutherland and Brooke Adams is also running on the Encore Suspense Channel, for those who may like to compare the two different versions. It is now airing on Retroplex, for those interested in seeing it. Seed pod time. 2nd version not bad just not near as good. Nothing is as bad as something that is not so bad. (Leslie Howard from the Scarlett Pimpernel and my motto under my avatar). I believe this is FredCDobbs' favorite science fiction movie. He mentions it quite often in various threads. Yes, nice idea...but what if they put those donations towards making more wine promos...? Red-necks like me don't drink wine. We drink Bourbon. My guess is that this film will not show up on TCM until they do a special monthly spotlight on classic science fiction. This genre is TCM's ill-begotten stepchild, and they usually do not show too many sci-fi offerings. But when they come around (provided they will come around), how can they continue to overlook this gem..? I think it was back in June 2010 when they did a monthly spotlight on drive-in movies...and they did show a lot of the cheesy sci-fi and horror flicks from the late 50s and 60s during that series. But if you blinked, you missed them, because most of those have never been repeated on TCM. THE FORBIDDEN PLANET is definitely an overplayed title on TCM because of it's an MGM picture and in the TCM Library. 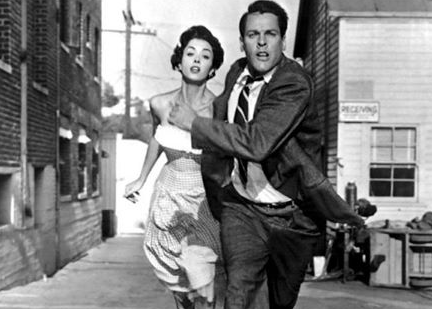 I think TCM should do an evening of films honoring either Dana Wynter or Kevin McCarthy, and put this one on first. "The List of Adrian Messenger"
I haven't seen THE LIST OF ADRIAN MESSENGER. She appeared on an episode of Ironside and she was very good on that show. "The List of Adrian Messenger" is or was on YouTubes a few weeks ago. There is kind of a contest of who can overact the most,Kirk or George. But Dana is great as is the french guy and the surprise actors are fun to watch. It's fun to watch. Maybe TCM will air it in December when Kirk turns 100. Imagine: Whit Bissell, King Donovan and Sam Peckinpah all in the same movie!! Still can't believe TCM never airs this great classic. They teach INVASION OF THE BODY SNATCHERS in film schools. It's considered a seminal work of 50s science fiction. Terrific film, it never grows old. Even the remake is well done. I could stand to see a back-to-back with these two.